Even at the height of his acclaim in the 1920s and 30s, the mixed-up little black cartoon feline known as “Krazy Kat” could hardly be called popular, ranking at the bottom of readers’ polls in the newspapers in which he and his surrealist world regularly appeared. Nearly a century later, however, the unusual comic and the complex life of its New Orleans born author are enjoying an improbable moment in the spotlight, thanks to a new biography receiving glowing reviews in national publications like the Washington Post and an outpouring of love and enthusiasm here in New Orleans. 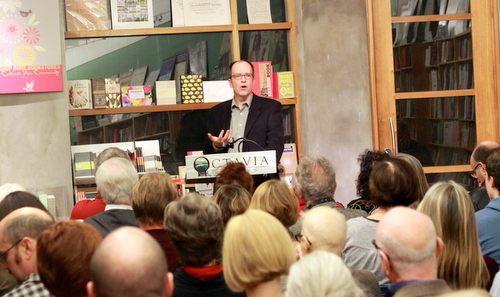 Michael Tisserand, a former editor of Gambit and author of the books “The Kingdom of Zydeco” and “Sugarcane Academy,” this week released “Krazy: George Herriman, a Life in Black and White.” In addition to a series of appearances and book signings — including a first reading of it on Tuesday at Octavia Books — Tisserand’s biography is also drawing substantial media attention. 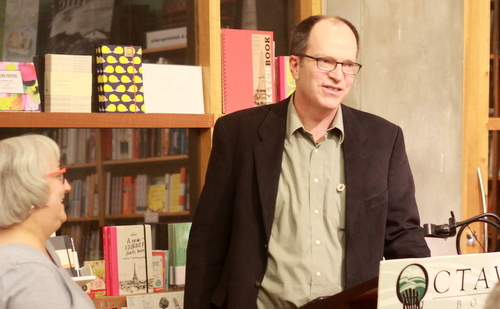 That life story, Tisserand explained at Tuesday’s event at Octavia Books, may apply to all of America, but would almost have to have roots in New Orleans. Herriman was born into a prominent Creole family in the Treme — his birth certificate marked “Colored” to designate his race — but at age 10, his family decamped to California and he spent the rest of his life “passing” for white. His colleagues and acquaintances were so unaware of his ethnicity that they dismissed his curly hair and other treats as due to some unknown Mediterranean lineage (“George the Greek,” they called him), and his Creole roots were not publicly discovered until long after his death. Why Tisserand’s family left cosmopolitan New Orleans and their African-American identity behind for the frontier town of Los Angeles has not been recorded, but Tisserand notes that the late 1800s were a time of rising racial tension in the city and across the country after the end of Reconstruction. Even in the churches where whites and blacks had recently worshipped side by side, the white parishioners were constructing new rules to drive the blacks out, Tisserand said. “He never spoke directly about leaving behind his life in Treme,” Tisserand said to the audience at Octavia. After a classical education, Herriman began his cartooning career on the sports pages. In 1910, the country was riveted by a heavyweight boxing match between Jack Johnson, a black man and rising star, and Jim Jeffries, a white former champion pulled out of retirement to save the reputation of the white race in the boxing ring. After Johnson won, race riots broke out with whites attacking black fans for cheering Johnson, and the newspapers that had relentlessly promoted the fight suddenly took strident anti-boxing stances. Herriman, however, still managed to sneak his view of the hypocrisy of the reaction into his comics, featuring a strip set in a theater where everyone could enjoy the bout while wearing color-transforming glasses. The cartoon black cats that Herriman had used to depict black boxers in his sports strips may have been the basis for “Krazy Kat,” which featured the title character, a black cat, as the perpetual victim of bricks thrown by Ignatz, a white mouse. Krazy Kat, however, was less overtly political and more philosophical. 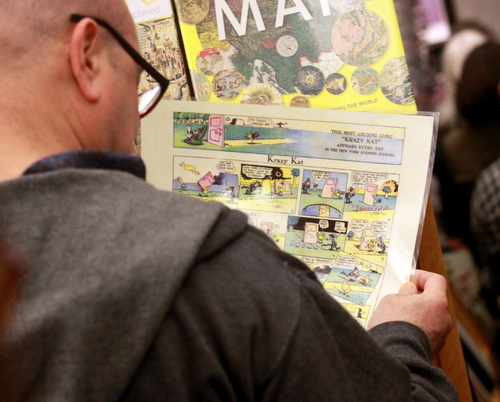 Herriman uses the discourse between Krazy Kat and Ignatz to offer sly commentary on language, love and other esoteric topics. While the comic lacked popular support, it was widely celebrated by the intellectuals of the day, such as the poets e.e. cummings and Langston Hughes. It appeared in the “City Life” section of the newspapers dedicated to more highbrow topics at the personal insistence of publisher William Randolph Hearst. And while his fans admired the strip’s combination of abstract whimsy and subversive intellect, they never suspected Herriman’s own complex racial identity — even leaders of the black intelligentsia like Ralph Ellison later said they never dreamed that Herriman was one of them. While Herriman may have concealed his New Orleans roots, Tisserand clearly relishes his place in the city’s culture — and the feeling is mutual, said Octavia Books owner Judith Lafitte. 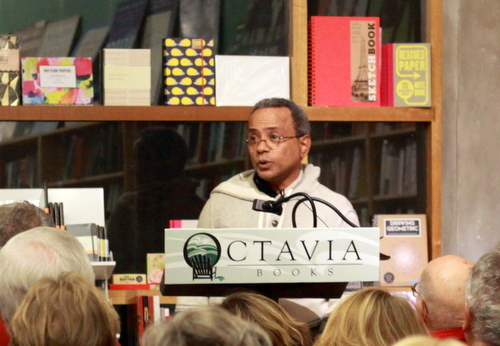 More than 150 people showed up for the book’s debut, with Herriman relative John Boutte opening the evening with an a capella version of “You Have to Be Carefully Taught” from South Pacific. The Church of Our Lady of Good Counsel presents ‘A Garden District Christmas Concert’ Advertiser Bulletin: Give the gift of Fashion this year! !